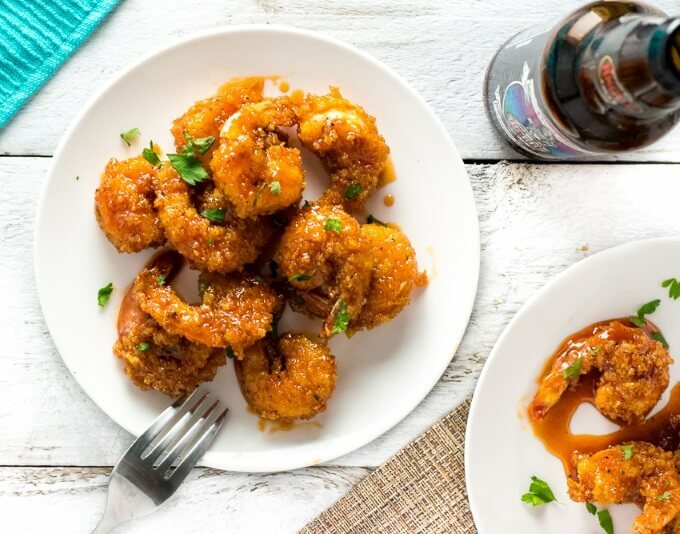 It only takes minutes to prepare these sticky oven baked shrimp which are coated in a crisp panko breading and smothered in a sweet and sticky glaze that will have you licking your fingers in delight! I’ve always joked that I just enjoy food simply because it is a vessel to eat condiments. Well, this sticky oven baked shrimp recipe will certainly attest to that. 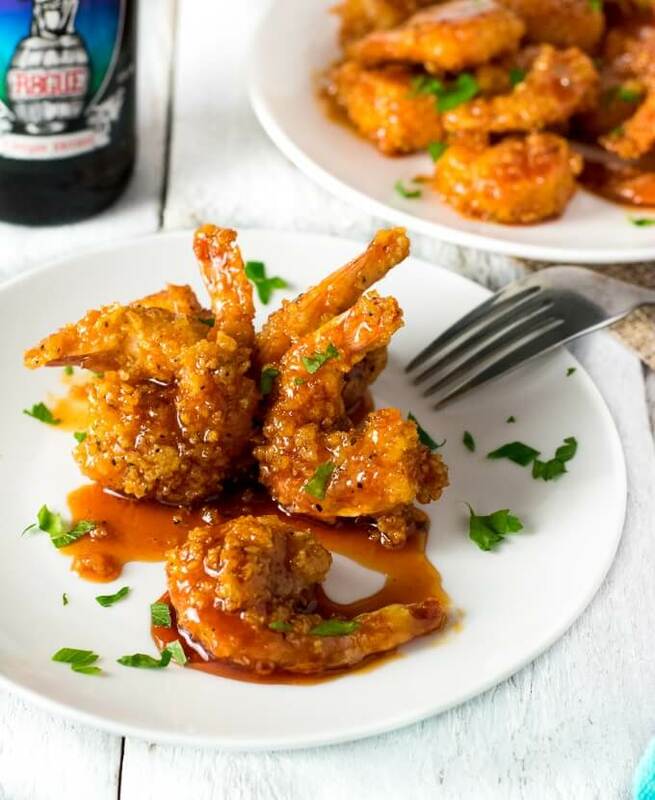 The whole point of this recipe is to create a crisp and crunchy canvass to smother with that intoxicatingly sticky sauce! Heck, if it were socially acceptable, I would probably drink it. 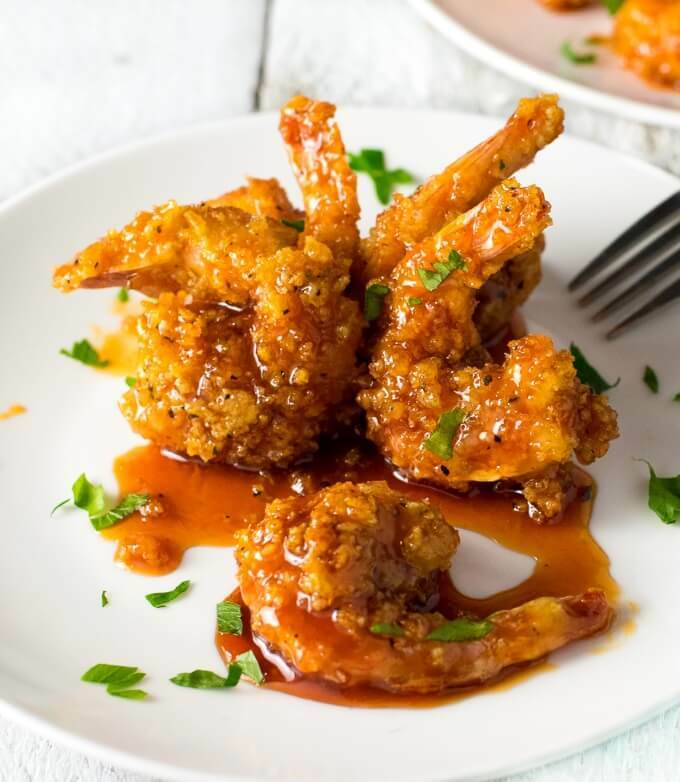 A sweet and sticky mixture of melted brown sugar and Franks Hot Sauce quickly simmers on the stove top into a tantalizing glaze that coats every nook and cranny of these Sticky Oven Baked Shrimp. It is the perfect balance of heat and sweet. The longer you simmer the sauce the thicker it will get. If it is too runny, simmer it longer. If it gets too thick, add a splash of water to thin it out. I originally got the idea for this glaze from a chicken recipe I found on Pinterest. The great thing about this recipe is the lack of specialized equipment needed to make it! You own baking sheets, right? 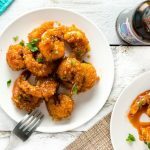 (affiliate link) Simply throw your breaded shrimp on a baking sheet and place it in an oven preheated to 400 degrees. It is important to have your oven preheated first because shrimp cook fast and you need the high heat to crisp the breading. My oven baked shrimp cook for 10 minutes at 400 degrees. However, cooking time can vary slightly depending on your oven. It is also worth noting that breaded shrimp can take a couple extra minutes to bake compared to unbreaded shrimp. Add flour, to a dish and season with salt. Add eggs to a separate dish and panko to a third dish. Season panko with salt as well. Pat shrimp dry and toss in flour, shaking off excess. Working in batches dip shrimp into beaten eggs, letting the excess drip off. Toss shrimp in panko bread crumbs, ensuring even coverage and then place on greased baking sheet. Place shrimp in the oven and cook for 10 minutes, or until cooked through. While shrimp is baking add brown sugar, hot sauce and garlic powder to a sauce pan and set on medium heat until sugar has dissolved and everything is incorporated. Stir as needed. Sauce will thicken as it simmers, add water to thin it out if needed 1 tsp at a time, but this should not be necessary. Remove shrimp from oven and place in a large bowl. Pour in sauce and toss to coat evenly. IF YOU LIKED THIS RECIPE check out my Marinated Tuna Steaks recipe too! This recipe was originally published on FoxValleyFoodie.com October 10, 2016. If you enjoyed reading my Sticky Oven Baked Shrimp recipe then you should probably like me on Facebook and follow me on Pinterest too. That’s what I would do at least, because if you don’t get to know me but you still use my recipe it is kind of like taking candy from a stranger, and your mom taught you not to do that. Don’t disobey your mom, subscribe to Fox Valley Foodie today. I’m considering making this for Christmas, for 24 adults. What size shrimp are pictured here? Does the panko brown nicely in the oven? Is the sauce generous, I don’t think I need to 6 X the recipe, do I? I used large shrimp, and I suspect they were 31-35 or 26-30 shrimp. The panko doesn’t brown deeply, but rather turn a roasted blond. Most of the color comes from the sauce, which is fairly generous. My golden rule is to always test a recipe before serving it at a gathering, particularly if you are scaling it significantly. It would allow you to see what adjustments need to be made before it’s show time!